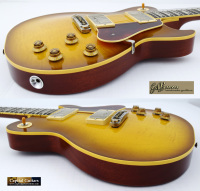 Offered here is an incredible Bluesmaster '59 by Johan Gustavsson of Sweden. 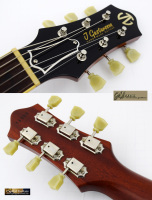 Most guitarists who have played one of Johan's guitars would not dispute that he is making some of the finest electric guitars currently available. Each of his works is in itself a masterpiece which he has somehow bestowed with a tone, look and feel that is reminiscent of a well preserved 50's vintage classic. 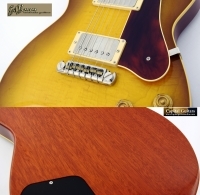 Along with a very desirable vintage vibe, however, you also get modern specs, a build quality that is beyond reproach and playability that few real vintage electrics can match. 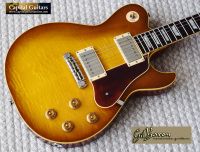 The Bluesmaster 59 is of course Johan's version of the venerable '59 LP and is among the best interpretations of this classic electric that you can find anywhere, at any price. 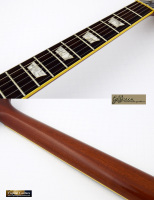 It's specs include: a solid premium grade Mahogany body; a lightly figured Eastern Maple top with a faded tea burst nitrocellulose finish and a total guitar weight of just 8.25 pounds; a 24.75" string scale Mahogany neck with extended tenon, a '59 C shape and depth measurements of .90" at the 1st fret and 1.00" at the 12th; a gorgeous Brazilian Rosewood fretboard with 12" radius and 1.685" bone nut; a Gustavsson/Pigtail intonatable wraparound bridge piece; a gorgeous bound tortis pickguard; and for electronics, Wolfetone humbuckers with LP style controls and wiring. 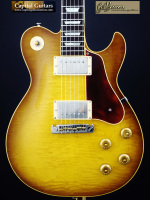 The feel of this guitar is decidedly LP-like, but few LP's you will ever play sound or play as well as this instrument. 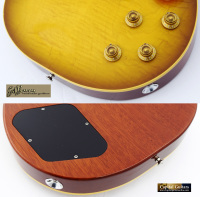 The setup and playablility are impeccable and the tone is killer; fat and woody. Please check out the brief sound sample provided. This guitar was built in 2006 and has seen very little play. The frets are near spotless. 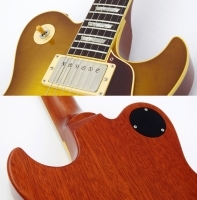 Johan lightly distresses his instruments to give them a vintage look and feel. Other than his aging, the only flaws of any significance on this guitar include some very light worming on the back which I have attempted to picture with limited success. Otherwise, this guitar is in superb condition. 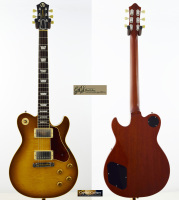 It comes in it's original Ameritage Gold series case with humidification along with the certificate of authenticity and a spare pickguard if you prefer a more traditional LP-like look.